At approximately 4:45 pm on Saturday, February 20, 2016, three Anaheim police officers were involved in a fatal Officer Involved Shooting of an armed attempted murder suspect. The incident occurred when officers were called to the 2000 block of W. Cris Avenue to investigate a possible shooting. The Anaheim Police helicopter arrived on scene and observed the suspect standing over a male victim who was lying in the street bleeding. The suspect was pointing a handgun at the victim. While the helicopter was orbiting and directing ground units to the scene, it is believed the suspect fired the handgun at the police helicopter and its crew. The helicopter was not struck. When ground units arrived, they confronted the suspect who was still holding the firearm. The suspect dropped the gun, but did not comply with the officers’ commands, at which time three officers discharged their firearms striking and killing the suspect. The officers’ body worn cameras were activated at the time of the shooting. The victim suffered a single gunshot wound to his leg and was transported to the hospital in stable condition. A firearm was recovered near the suspect’s body. No officers or bystanders were injured. Preliminary investigation has revealed that immediately prior to shooting the victim on W. Cris Ave, the suspect discharged a firearm at two people near the intersection of S. Roberts St. and W. Juno Ave., but neither of those victims were struck. The victims from the Juno and Roberts shooting did not know the suspect and the motive for that shooting is not yet clear. The suspect then drove to his estranged wife’s residence on W. Cris Avenue where he shot the victim who is his brother in law. While on the way from Juno and Roberts to Cris Ave, the suspect brandished a firearm at several people from the driver’s window. Several witnesses called 911 to report the shootings. Portions of the 911 calls are attached. 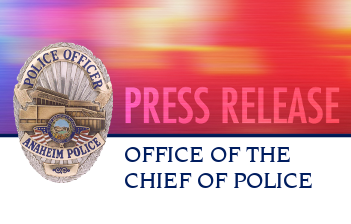 In accordance with established protocol the Orange County District Attorney’s Office will lead the investigation with the assistance of Anaheim Police homicide detectives. The Anaheim Police Department’s Major Incident Review Team (MIRT) and the Office of Independent Review (OIR) will conduct concurrent administrative investigations. The suspect has been identified as Danny Rendon, 30, of Anaheim.